Store Hours: Tues-Fri, 10 a.m. - 6 p.m. Sat, 10 a.m. - 2 p.m.
Sunday, Monday - gone riding! Take S.S. Parkway eastbound to Exit 35 (Wellwood Ave). Make a right turn from ramp onto Pinelawn Road north. Go three traffic lights; at third light, make a right turn onto Edison Ave. Take it down to Jersey Street, and make a left. We are at the end of the block on the right side. Take S.S. Parkway westbound to Exit 36 (Straight Path). Make a right turn from ramp onto Straight Path north. Go two traffic lights; at second light, make left turn onto Edison Ave. Take it down to Jersey Street, and make a right. We are at the end of the block on the right side. Take the L.I.E. east to Exit 49S (Amityville). Stay on service road to the third traffic light. At third light, make right turn onto Pinelawn Road (towards National Cemetary). Stay on Pinelawn Road until you pass railroad tracks. After tracks, continue on Pinelawn Road to the third traffic light; at third light after tracks, make a left onto Edison Ave. Take it down to Jersey Street, and make a left. We are at the end of the block on the right side. Take the L.I.E. west to Exit 49N (Huntington). Make a left at the first light onto Pinelawn Rd. Stay on Pinelawn Road until you pass railroad tracks. After tracks, continue on Pinelawn Road to the third traffic light; at third light after tracks, make a left onto Edison Ave. Take it down to Jersey Street, and make a left. We are at the end of the block on the right side. © 2014 - All images and content on this site copyright of Powerhouse Motorcycles, New York. 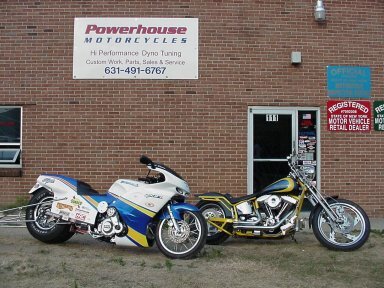 Unauthorized use of these images or content without written permission of Powerhouse Motorcycles, New York is an infringement of copyright law and will result in legal action. All rights reserved as protected by Federal copyright laws.